I grew up camping with my family and learned a lot of great tips and hacks from my parents. As a teen I learned even more on a week-long no-trace camping trip to Algonquin Provincial Park. That experience was incredible, we had to carry around our lives in our backpack and also our canoe. It is something I would love to do again! If you have a camping trip in the making, then check out this clever list of camping food hacks! These are going to make your camping trip a breeze! Staying outdoors means you are cooking without your stove or microwave, so you have to get creative! 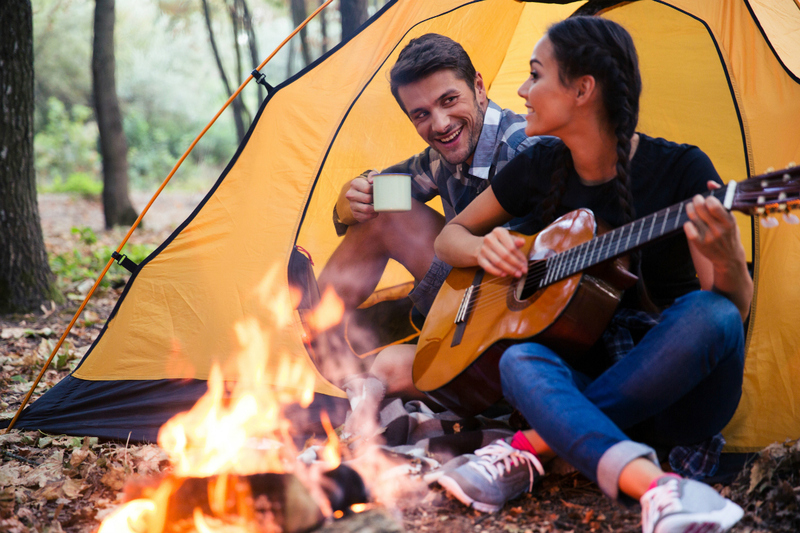 Below are some genius camping food hacks that you will want to try out, to make the great outdoors a little bit easier! From how to cook bacon, treats for the kids and so much more. When transporting your eggs from fridge to campsite, consider placing in a bottle. You can use an old water bottle, creamer bottle or whatever you have. Just crack up your eggs and pour the egg into bottle. Works great for shaking up and pouring directly in the pan for scrambled eggs! When taking spices to the campsite, consider packing some in a tic-tac container. Just put one spice in each container, and it is nice and compact, and will spice up your meals tremendously! If you don’t have tic-tac containers, use sandwich bags or even pill containers. Just make sure to label what spice is what. Pack cereal in old coffee creamer containers, or any other container that has an easy pour spout. In the mornings all you have to do is pour into bowls and serve. It works great and keeps them from going stale because someone forgot to close the bag! Love coffee and don’t want to go without? Take a coffee filter put enough coffee for a cup, and tie it off with dental floss. Then when you are camping boil some water, and toss a pouch in and let it steep for a little. In a few minutes you will have a perfect cup of coffee. Place your salads in plastic disposable cups and put a lid on them. They are ready to go when you are ready to eat and there is no prep at all. Take tinfoil and place your hamburger patties or even hot dogs in the center. Do one tin-foil for each hamburger, and add in diced potatoes, onions, peppers or whatever you want. Wrap in tinfoil and then cook until everything is done. If your meat has no grease, I recommend adding a teaspoon of vegetable oil or some garlic butter. I also recommend dicing up the peppers and such and store in sandwich bags, so there is no real prep. For a quick treat, cut the middle of an apple out and stuff with trail mix or granola. Put the apples in a pan or wrap them in tin foil and cook until the apples soften for a tasty treat. With the skin on the banana, slice down the middle to open it up a little. Then stuff with chocolate chips, marshmallows, peanut butter chips or whatever you want. Cook on the open fire until the marshmallows are melted. The kids love to make and eat these delicious treats. If you have never had a treat inside of a cone, you might be missing out. This is a staple in most camping trips! You take a waffle cone and put sweet treats like marshmallows, chocolate, peanut butter chips, etc. Then wrap the cone in foil and heat it up until the marshmallows begin to melt! Take skewers and wrap your canned cinnamon rolls around the skewers. Cook them over the fire until they are done, then drizzle them with the glaze. This makes cooking them easy, and each person can have a skewer with a cinnamon roll. Line the bottom of a paper bag with a few strips of bacon, make sure not to overlap. Then put a few eggs in, fold the bag over attach to the end of a stick and roast over hot coals for around 10 minutes. This will cook the eggs and bacon nicely. These are incredibly delicious and perfect for camping! Pack individual bags of Fritos or Doritos. Then all you need to do is cook your meat, toss some in with shredded lettuce, cheese, etc into each single serve bag. Quick meal with no mess. You eat directly out of the bag. Pre-make breakfast burritos at home, and then wrap them in tinfoil and place in a freezer bag. When you are ready to cook, simply cook them in the tinfoil on warm coals until cooked through. Pack some cut up veggies and skewers. For dinner pop your veggies onto skewers and cook over the coals. This is a great way to still be able to incorporate veggies into meals. Do you have any great camping food hacks to add? Share them below in the comment section! Camping with a baby? Check out these hacks and tips for camping with a baby! I love the idea of single serve cups of coffee! That’s so smart! These are all great tips and I love the easy and tasty recipes!! Lots of yummy tips and ideas i can’t wait to try the Banana Boats next weekend ! These are all awesome tips!I love the eggs in a bottle tip.It keeps the eggs safe from being banged around and also saves space.It’s so perfect for scrambled eggs in the morning!